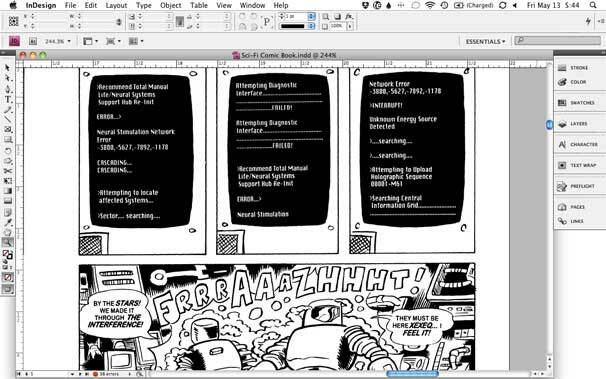 In my last article I talked about using your Mac to create printed comic books by scanning, editing, and enhancing your original comic book art. This time the focus is on organizing that artwork in a page-layout document, adding word balloons or sound effects, and working with your copy shop to create the best-looking book for the money. Before you import and arrange your scans, contact your copy shop to ask what order they’d like you to provide your pages. This will be either sequentially or in printer’s spreads that appear out of order in your layout document, but fall into the proper sequence when printed and folded in a book. Organizing pages sequentially is easy. Create a new page-layout document at the size of your individual pages (mine were 5.5 by 8.5 inches). Allowing for a .25-inch margin on all sides, center a picture box on the page. Artwork beyond this area may be cropped during printing. 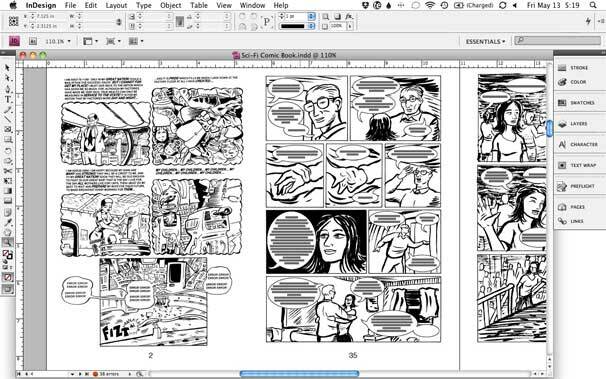 Duplicate the page until you have enough for every page of art in your comic, including covers. Then, starting with the front cover, insert each page of scanned artwork in order until the pages of your book are full. Making printer’s spreads is a little trickier. Create a horizontal document the size of the paper on which your book will be printed (in my case, this page was letter-size). Leaving a .25-inch margin around the page, center a 5 by 8-inch picture box in each half of the page, then duplicate the page until you have one page for every two pages of art in your comic (for example, a 24-page comic would consist of 12 pages). On the first page, insert the last cover of your comic in the left picture box and the first cover of your comic in the right picture box. Continue inserting artwork on each page in your document, counting up from the first page and down from the last, until you have two sequential pages in the center of the book. Note that all odd pages will fall on the right, and that all even pages will fall on the left. Printer’s spreads may look wrong onscreen, but they’re right in print. Even if your artwork already contains hand-lettered text, you can spice up your pages by adding text in your page-layout program. Anything from simple page numbers to full narration, dialogue, and sound effects is possible. Your Mac comes with a few appropriate typefaces (including Marker Pro and Cracked), but you can find many more at websites like Comicraft and Blambot. Whichever fonts you use, adjust your text’s line and character spacing to sit comfortably on the page, and keep the styling simple. Your words and pictures should work together, not compete for the reader’s attention. Rectangular narration boxes are easy enough to add to your pages, but if your software allows, you can also combine freehand shapes with ovals to create traditional word balloons. For a more organic look, leave empty word balloons in your original art, then fill them with text on your Mac. This will take some planning to ensure you leave enough room in your drawing for text, but the results are worth it. Combining handwritten dialogue and computer typefaces can make for striking effects, too. For example, the voice of a robot character might be more dramatic with its dialogue printed in a mechanical typeface. However you use text in your project, print out and compare different type sizes until you find one that works best. I’ve had good, legible results with dialogue text as small as 5 points, but your preferences may vary. Combining different kinds of text on your page can lead to striking results. When your book is laid out, you’re almost ready to produce a file to send to your copy shop. Getting the file right the first time will save you headaches and maybe even money. That means communicating with your copy shop early in the process of creating your book and following their instructions when submitting your file. Before creating your final file, discuss your project with your copy shop, and read any file submission guidelines it has posted online. If these guidelines don’t refer directly to the page-layout software you’re using, ask about any notes or tips regarding files made with your application, or the version of the application you’re using. Whichever program you use, it’s a safe bet the file format your print shop will prefer is PDF. A PDF file will include all the fonts and high-resolution images used in your comic book, but only if it’s properly created. Your copy shop can provide you with the exact specifications to use when exporting your project, but in general you’ll want to use the highest-quality (or “For Print”) settings to ensure the best results. After the PDF is submitted, ask to see a proof copy of your comic before all your booklets are printed. Your copy shop will offer a range of printing and finishing options that can improve your project. The simplest and least expensive of these is to use a heavy or colored paper stock for your cover. You can also trim the outer edges of your pages to eliminate their white border, giving your book a professional-looking bleed. If your budget allows, color printing on your cover is another great––if pricey––way to make your comic stand out. Remember that you’ll get a better a deal on many of these extra features the more copies you print. 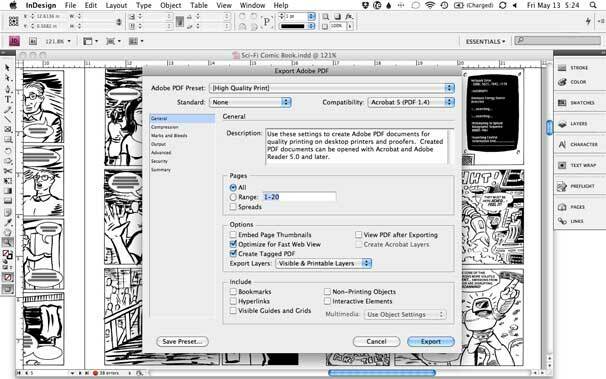 Exporting your graphic novel as a PDF file ensures your fonts and images will print as you expect. Creating your own comic book or graphic novel is hard work, but it’s also a fun project that’s easy to share with others. Comics fans are always on the lookout for something new, and local comic shops or conventions are great places to reach them. Even if you don’t start the next great publishing empire, you just might end up with a loyal fan base to satisfy.